Risk management is, in my opinion, one of the most important ground school topics in paragliding. It is crucial to talk about it in order to create safe pilots and to improve the general safety level of the sport. It is also probably the most difficult topic, as it involves fighting some human tendencies, accepting our limits, thinking for oneself instead of following the group or trying to attract attention and admiration of other pilots and spectators. It is all about attitude. There are rules, and the challenge is to follow them in a way that that even if you make a decision that turns out to be a mistake, you still have a margin of safety. When we fly we need to take precautions to make the risks as low as reasonably practical. It is always a question of balance between risks and benefits. The figure below is a simplistic representation of how we take decisions that involve risk in general, not only in paragliding. One of the reason it is difficult for us to follow the rules is because of the type of people involved in the sport. I have collected some opinions on the web coming from people around the world answering the question: "why do people like to take risks? The most frequent answers were referring to people who appeared to be: addicted, extremists, daring, enjoy the thrill, new emotions, love of freedom, not conservative, ignore the law! Without discussing all of that in details, it is probably "safe" (!) to say that paragliding pilots are independent people in general, selfish in some ways, who like challenges and like to share their exploits. Marvin Zuckerman, a professor of clinical psychology at the University of Delaware describes adventure/sensation seekers as people who lust after novel, intense experiences and are willing to take any manner of risk (physical, social, legal or financial) to satisfy their urge. "how often" multiplied by "how bad." For example the risk associated with a having a wingtip collapse while flying is "frequent and negligible." That&apos;s the risk that pretty much every pilot is ready to accept. The risk associated with a cravat is more like "remote and critical." All events in paragliding could be assigned some risk value based on data collected over many years, one large set of measurements and observations. The problem is that it is difficult to predict the risk of having an accident because there are too many parameters involved among the conditions, the pilot and the equipment. The other problem is that one flight cannot make you predict what your next one will be. In statistics these are referred to as "independent events." You can flip a coin 100 times, the next time you still don&apos;t know which way it&apos;s going to turn up. You can have 100 great flights in a row; you cannot predict what flight #101 will be like. This is probably the main problem: Some pilots take some risks, they have no accident that day, so they think it is OK to continue taking the same risk on a regular basis - until the accident happens. Very often, after an accident occurs, we hear comments like, "This is a great pilot," meaning, "I am wondering what happened - it cannot be the pilot&apos;s fault, it was bad luck." 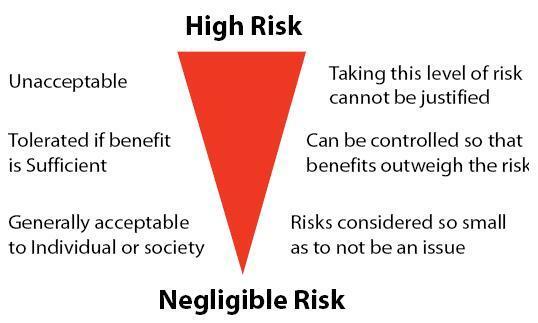 Risk assessment is often based on subjective perceptions of risk. In an interesting article published in Psychology Today (March-April, 2002, by Farrin Jacobs), the author reported that the more experience adventure racers have, the more likely they are to take big risks. But they no longer consider their actions risky. In other words, the more they race, the more their perception of risk changes. This is of course related to their level of confidence. But it does lead to accidents in paragliding. Now let&apos;s imagine the perfect pilot, flying the perfect site (big launch, big LZ, no obstacles), in the perfect conditions. It is someone who has the complete gear that is in good shape. She (it has to be a woman to be so perfect!) is in a good mood today, her ego in general is not interfering with her decisions, the weather is great and there are already some happy pilots in the sky reporting dream conditions with good lift, no turbulence. So, here is our pilot launching, flying far from the ground. What are the risks that an accident will happen? Very low. An unpredictable turbulent mass of air that the pilot will encounter close to the ground, or a collision with someone flying into her from her back? How often does this happen in reality? This is hard to tell, but probably not very often. But, what is for sure, is that most of the reported accidents in paragliding have been described as pilot error. It used to make me feel better to know that, because then I would think, "Oh well, I would not have done that, not me." But after accumulating mistakes myself I&apos;ve had to become more humble. The reality is that we all make mistakes, all the time. So don&apos;t use that as an excuse, it is the worst one. "Oh, she had an accident because she made a mistake." The biggest mistake is to think that we won&apos;t make any. We all do. There is no classification of risks I think, because they are all related to our behavior. The most important fact, by far, is that the risk of accident can be reduced with the right attitude. The main danger in paragliding is the pilot. Acknowledge the risks, don&apos;t deny them. Be aware of all the types of accidents that can happen, take all the preventions against them and, most importantly, admit that we all make mistakes and that&apos;s why we need to follow some safety rules. Listen to more experienced pilots&apos; advice; pick a good mentor. Chances are that your flying styles will match. Assess your mental and physical health. Know your limits, i.e. your level. Always ask yourself, "What kind of pilot am I?" Question yourself about a series of incidents (forgot your helmet at launch, landed out, disgraceful landing) and take them as warnings. Make the effort to debrief. Listen to your intuition. Get a sense of the site and the conditions for yourself. When in doubt, don&apos;t fly. I think women are better at that - but I was surprised to see that in France female pilots have roughly the same percentage of accidents as men (although for some reasons they are less involved in fatal accidents). The following advice comes from Chris Santacroce: "Be aware that your overall flying enjoyment and success will run through a few cycles; you will have a series of good flights and then some bad flights. Stay aware of where you are in this evolution. Adjust your decision-making accordingly. "The question becomes: What does it take to be in an accident? What are the precursors? It is actually not a mystery. There are not so many &apos;unlucky&apos; accidents. There are warnings! Often a sequence of three (bad landing the day before, forgot to attach your speed bar, didn&apos;t check the wind strength) will be your indication that you are headed for trouble. "Cultivate your &apos;healthy flying mindset.&apos; It&apos;s a full-time job". Use the right equipment and check your equipment all the time. Know the preventive or corrective action plans. The benefits of attending SIV clinics are obvious here. Continuing education can only be beneficial. Fly far from the ground. Terrain clearance is a key factor. Note that the so-called "intermediate syndrome" is not exclusive to intermediate pilots! At all levels we can think we are better pilots than what we are. Knowledge, skills and attitude are key ingredients to make the sport safer. It is about you as an individual. Even though this is a dangerous sport, if you exercise your new skills and avoid allowing your ego to stop you from making rational decisions, you can decrease the risks a lot. Irene Revenko learned to fly in her native country of France over a dozen years ago, earned her basic USHPA instructor rating in the spring of 2003 and her advanced instructor rating in the spring of 2005. She enjoys thermal and cross-country flying and has competed for the last four years, placing second or third for women at the 2001, 2003 and 2004 U.S. National Paragliding Championships. She has a PhD in bioengineering, and when she&apos;s not flying or competing she works as a physician (clinical pathologist). She has two wonderful children, Tania, age seven, and five-year-old Alexander.